Throughout his proverbs and other writings, King Solomon stresses the importance of individuals acting with wisdom and prudence to create prosperity and goodwill. Addressing readers as “my son,” the wise King praised people responsible for their actions, working on their own to create a world based on the word of their God. In the book of Solomon’s Proverbs there isn’t a mention of the wisdom of groups and other entities. Now, as federal mortgage giant Fannie Mae prepares to sell off a majority of the foreclosures it owns to large investment companies, individual buyers, including solo investors, are locked out of the opportunity to bid on these properties. Freddie Mac, officially known as the Federal Home Loan Mortgage Corporation, and Fannie Mae, or the Federal National Mortgage Association, were created to help make home ownership accessible to more people. By the end of 2007, these two entities, along with the Federal Home Loan Banks, were providing 90% of the financing for new mortgages. By the end of 2008, as the subprime loan market was collapsing, Freddie Mac and Fannie Mae stepped in to guarantee even more sub prime mortgages in an effort to reassure the housing market. As the collapse continued, the government had to put at least $150 billion into keeping these agencies afloat, and the Federal Housing Finance Agency eventually put both of them into a temporary conservatorship. As of 2012, that conservatorship still holds. A new wave of foreclosures usually means good news for property investors looking to buy inexpensive priorities. 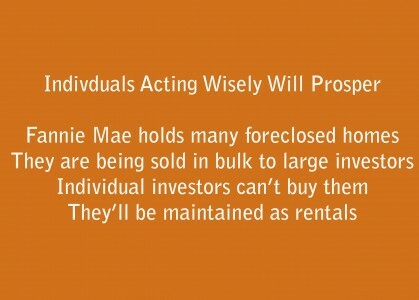 This time, though, Fannie Mae announces not one but two bulk sales of its foreclosed homes, not to individual purchasers, but to large investment companies, locking the solo investor out of the opportunity to participate in the sale of these properties. These properties – all 2,000 of them — are nearly all single-family homes being sold to investment companies in Florida and California to firms that have committed to rent them for a minimum of three years. These firms claim that their strategy is to benefit the distressed neighborhoods where most of these homes are located, and that some of these properties may go back on the market for general purchase sometime in the future. Some worry that the overload of rentals might hurt neighborhoods, and by taking these homes out of the reach of potential buyers, a permanent rental class might be created. Other real estate experts point out that markets are always in flux, though, and what’s true now may not be so tomorrow. For those investors who are following Jason Hartman’s recommendations to buy single family homes on a long term fixed rate mortgage, Fannie Mae’s move may or may not have a significant impact, depending on the market. But the Fed’s decision underscores the importance of acting quickly – and prudently – to secure the investment properties you want while they’re available.